The house has everything you need for a romantic getaway or a friendly get together. Recently renovated (updated images to come) with new furniture and fittings. The lighting has been redesigned so every room and every corner can be adjusted to suit your needs, romantic, functional or for work. Accommodating up to eight people, Tanglewood Cottage features three bedrooms (all with BIR) with a total of two queen beds, 1 single bed with a trundle, and a queen/single bunk bed. A Port-a-cot is also available. All linen as well as blankets, pillows, doonas, towels are supplied. From the house, deck and the gardens there's a peak at the Grampians. Thanks Alison, glad you had a good time, hope you will come & visit the beautiful Grampians again soon. Thanks Lalage & Ross, glad you had a great stay & you are more than welcome to come & stay again. Tanglewood is a fresh, well resourced, comfortable place to stay. 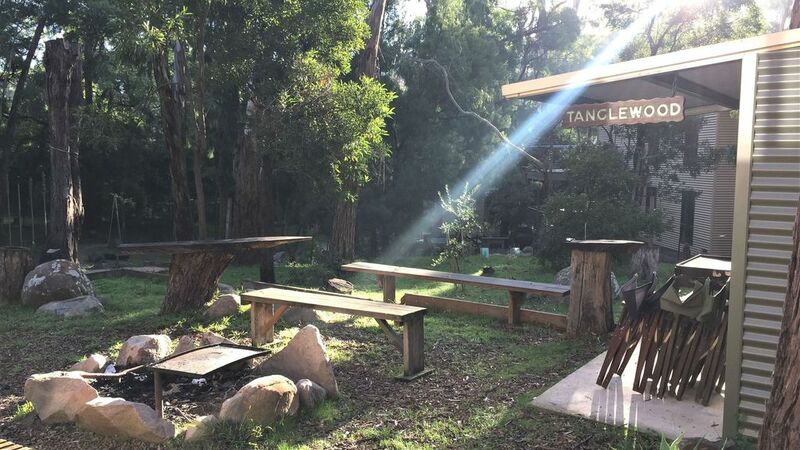 The weather can be treacherous outside - and a Halls Gap visit demands that you share the environs - but Tanglewood is a haven for rest, warmth and relaxation outside those times. Lovely, comfortable place to stay. We thoroughly enjoyed our stay at Tanglewood Grampians. The recent renovations were beautiful, and the house was spotless. Plenty of wood for the cosy log fire, and everyone enjoyed the spa! Within 5 mins of arriving we were greeted by a balcony full of super friendly Crimson Rosella's and cockatoos, that even sat on us. The kids were thrilled! Thanks for a great stay. We stayed two nights at Tanglewood and the house is simple but was comfortable and everything we wanted for our weekend at Halls Gap. Bruce the owner had excellent communication pre and post our stay. Would stay again!